FILE - Imports from the U.S. are seen at a supermarket in Shanghai, China, April 3, 2018. The president has threatened to levy up to $150 billion in tariffs against China and the deadline for that action is fast approaching. Even before US and Chinese officials sit down this week for a second round of high-level trade talks in Washington, both sides have been signaling a willingness to try and make a deal or at least meet the other halfway. Whether or not that will be enough to get them across the finish line remains to be seen, analysts say. Late last week at a forum sponsored by the Center for Strategic and International Studies in Washington D.C., Chinese Ambassador Cui Tiankai signaled China’s willingness to address a range of issues from the deficit to the protection of intellectual property rights. Cui said that while it is overly simplistic to say trade deficit means loss and surplus means gain, there is a clear need for better macroeconomic coordination between the two countries. 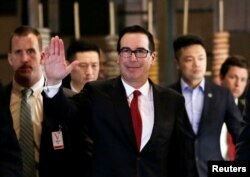 U.S. Treasury Secretary Steven Mnuchin, a member of the U.S. trade delegation to China, waves to the media as he returns to a hotel in Beijing, May 3, 2018. When Treasury Secretary Steven Mnuchin and China’s Vice Premier Liu He led trade delegations earlier this month in Beijing, the deficit loomed large. A leaked list of some of Washington’s demands included a request that China help cut the trade deficit between the two countries by $100 billion a year over the next two years. Many have scoffed at the figure and the possibility that Beijing could bridge such a seemingly huge gap, but Cui’s remarks are telling. Gene Ma, head of China research at the Institute of International Finance, said that even though negotiations may be hard, messy and ugly, that is better than not negotiating. And while there is room for hope, any agreement is unlikely without some compromise, he said. China has long been criticized for its trade policies, for forcing foreign companies to hand over technology in return for access to its markets and its rampant problem of intellectual property theft. 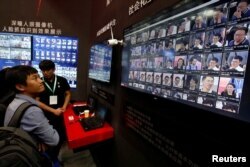 FILE - Facial recognition technology is shown at DeepGlint booth during the China Public Security Expo in Shenzhen, China October 30, 2017. Picture taken October 30, 2017. In a bid to change that, the Trump administration launched an investigation into Beijing’s policies and trade practices related to technology transfer, innovation and intellectual property. A public hearing will be held on Tuesday in Washington to discuss the tariffs, and if he chooses, President Trump could place a levy on Chinese goods as early as next week. If he does, China has pledged to respond in kind, threatening to raise tariffs on some $50 billion in American goods, including soybeans. 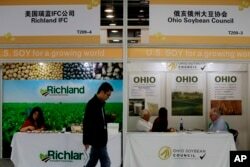 FILE - A visitor walks by U.S. soybean companies' booths at the international soybean exhibition in Shanghai, China, April 12, 2018. 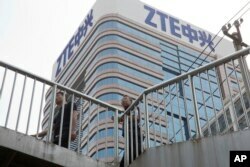 As for Beijing’s demands, one big concern is Washington’s recent decision to place a seven-year ban on the sale of American components to Chinese mobile phone maker ZTE. In the first round of talks, Beijing demanded that the United States amend the ruling. And then late last week, just days before talks were set to resume in Washington, the company claimed that its main business operations had ceased due to the ban imposed by the U.S. government. The move has highlighted the incredible leverage Washington has when it comes to technology, but also limits as well. Over the weekend, however, U.S. President Donald Trump said that he was working with Chinese President Xi Jinping to throw a lifeline to the company. Trump’s about-face has sparked outrage from some and concern from others. Some argue that if Trump does anything to reverse the ruling, he would be interfering with law enforcement. Others said the move will conveniently buy the administration more time to strike a deal. The Wall Street Journal has reported that the two sides are narrowing in on a deal that could see Washington use the ZTE ban in exchange for a reprieve of Chinese tariffs on billions of dollars of American agricultural products. But there are other obvious reasons for Trump’s shift. The most glaring of them is that while the ban would hurt ZTE and highlights how China lags far behind in the computer chip industry, it is also an issue of American jobs.